1. Terry LYDON was born on 11 April 1919. She married Charles Sextus Hodsoll WALLER. 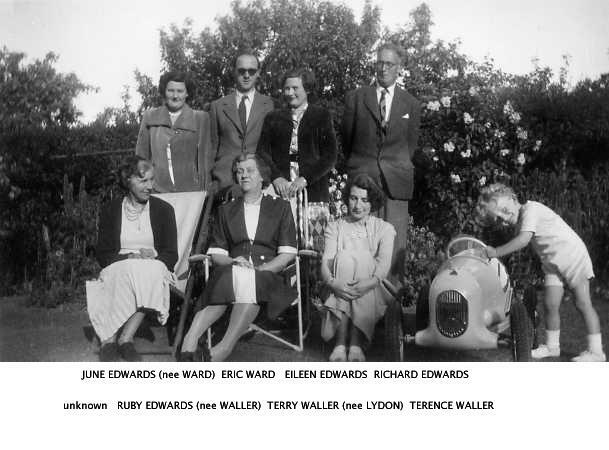 She married Cyril Llwellyn EDWARDS. Terence Charles WALLER (1948- ). Terence was born on 22 June 1948 in 21 Maxwelton Avenue, Mill Hill. He married Finola Mary WALSH on 21 August 1977 in St. Peter & Paul's Cathedral, Clifton Park, Clifton, Bristol.